With a few tips and simple to perform techniques, it’s easy to learn how to brush teeth just like a dentist. Proper brushing tools and techniques are important to keep the teeth and gums clean and healthy to prevent cavities and gum disease. It takes between two and three minutes to properly and thoroughly brush all surfaces of your teeth and tongue for proper oral hygiene. Begin with a soft toothbrush and fluoride toothpaste. A soft toothbrush is an excellent choice to effectively clean plaque and food debris from the teeth without being too abrasive. Those who have trouble handling a toothbrush might prefer to use an electric toothbrush for more effective brushing. To brush, begin at the gum line, holding the tips of the toothbrush bristles at a 45 degree angle to the gum line, then brushing in a downward stroke away from the gum line to the end of each tooth. Using short brushing strokes, follow with a gentle back and forth motion for each tooth. Begin at one side in the back of the mouth on the top row and clean the outside surface of each tooth, working around the mouth to the other side and ending in the back. Use the same process to clean the outer surfaces of the bottom row of teeth. Use the same techniques to work around the inside surfaces of the teeth. For the front teeth, it is easier to use the tip of the toothbrush by gently pulling the toothbrush from the gum line out to the edge of each tooth. When brushing the chewing surfaces of teeth, maintain short brush strokes in a gentle back and forth motion as well as in small, circular strokes. Finish by gently brushing the tongue and insides of the cheeks with gentle, circular motions. This will help remove bacteria to keep the mouth fresher and cleaner. If desired, a finishing rinse with water or mouthwash may be used. To learn more dental home care tips, it is important to see your dentist twice a year. For a dental check-up in the Bolivar, Missouri area, call Bolivar Family Dental at (417) 777-8654 to make an appointment with Dr. Paul Gonzales. 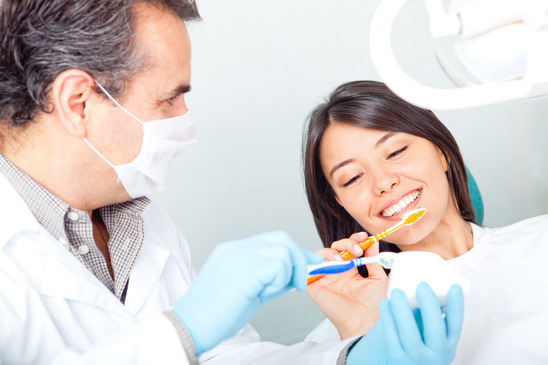 As dental care providers, we want to educate our patients about their specific oral health condition. This will allow us to help the patient prevent costly and unnecessary future dental needs.